You'll learn from artist Jane Davila about the ways that an artist coach can help you set realistic goals for your artwork in the Minding Your Business column. 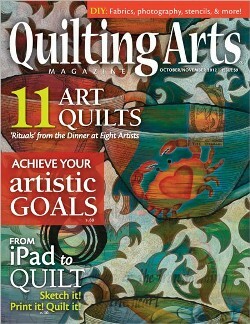 Plus, contributor Maria Elkins offers an excellent review of how to photograph your own quilts. And to feed your passion for surface design, you'll find step-by-step instructions for overdyeing fabric from Marcia Derse, and creating paper lamination stencils by Carolyn Abbott.